I must say at the outset that N. T. Wright has influenced my thinking about Christian theology more than anyone else. His work is top-notch and, in my opinion, his stock is elevated because he brings the historical and theological perspectives together and has applied them in his various positions in the academy, the church, and the government. 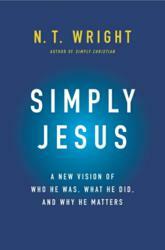 All of that to say that this book should be titled: Jesus: It's Complicated. As could be expected from his earlier work, in this book Wright attempts to open up his dense and nuanced arguments from Jesus and the Victory of God for the non-specialist/non-academic audience. The trouble is that he has already boiled down those arguments in The Challenge of Jesus. The conclusions in this present work are basically the same as those he's already put forward several times before (so I can't see why the subtitle mentions a "new vision"), but Wright has a brilliant mind and is able to say the same thing in fresh ways. In my own experience, it was upon hearing something for the fourth time that I finally grasped it (or maybe it grasped me). So I acknowledge the value of repetition. Wright does include a new image in this book: a "perfect storm." He contends that Roman occupation provided the winds from one side, Israel's nationalistic zeal was approaching from another side, and God's mysterious sovereign plan being unveiled in Jesus the Messiah converged with those two fronts. I liked the imagery and I think it added some coherence as he proceeded through his proposals about who Jesus was/is and what Jesus did/is doing. Personally, I think that if you're not going to read Wright's big academic book (Jesus and the Victory of God), then you should read The Challenge of Jesus instead of this one. Whichever book about Jesus you choose to read, I don't think you'll ever walk away thinking "that was simple"...if you do, then it probably wasn't the Jesus of history you were reading about!